The right preparations can transform painting into an arduous task to a fun activity! Whether you’re preparing to sell your home, deciding what to do with the walls of your new home, or just looking for a change, painting your home can be an intimidating task. To make painting your home as easy as possible and enjoy your journey to a beautiful new room, here are seven paint hacks to take the stress out of painting. We all know that walls should be clean and washed before painting, but how clean and how washed should they be? After you are done removing any residue or tape from the walls, use a dry Swiffer duster on each wall. These cloths will effectively and easily remove dust and dirt without the mess of buckets, sponges, and rags. The best part—once you’re done, throw it away. Paint swatches are great for initially selecting a color palette, but the best way to tell exactly how a color will look in your home is to paint a small area on your wall. Leave the paint there and observe it over a few days to see if you like it just as much in the morning as you do at night, how it compliments or clashes with your couch, and whether or not your high-efficiency light bulbs make it glow or…no. To get the most even coat, the trick isn’t to paint in a series of straight lines. Instead, paint in a “W” formation and fill in the gaps as you go. This distributes paint across the greatest surface area so no one section is too thick or too thin. If you’re painting a large surface area or multiple rooms, you probably have purchased multiple gallons of paint for your project. To ensure the most consistent color throughout your home, pour each gallon into a five-gallon bucket at once and stir thoroughly. Since each color is mixed individually, there are small variations in shade that can occur without you noticing until it’s too late. If you don’t feel like using the traditional bright blue painter’s tape, look in your pocket! Lip balm applied on the glass of your window where you’ll be painting the trim will help any stray paint easily wipe off. If you’re painting a door, put Vaseline on the hinges and plastic bags on the doorknobs for the same reason. While regular primer is the conventional choice for painting, if you’re painting over a darker color on your walls you should consider using a primer tinted towards the new color. This tint will help your new color stick and achieve optimal coverage without using gallon after gallon of paint. 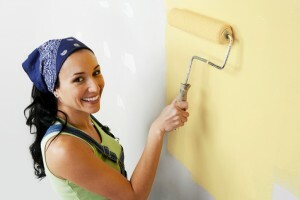 Painting your home can be a very smelly ordeal and the fumes can cause nasty headaches. If the odor of your paint is bothering you, add one or two drops of vanilla extract to each gallon of paint. This will help change the chemical aroma into something much more pleasant. Columbia Paint Company is happy to help you choose the perfect color for your painting project and offer you tips for every step of the way. Schedule an appointment today by calling 443-319-4001 or visiting us online. For more painting tips and updates, follow us on Facebook, Twitter, Google+, LinkedIn, Houzz, YouTube, and Pinterest! At Columbia Paint you'll find all the necessary tools to complete your project. We even offer color consultation to ensure your satisfaction. Visit our website, call us or stop in today!